I think I lived on frozen waffles when I was a kid. I still enjoy one occasionally, they are pretty tasty when you spread a little peanut butter on them. My kids aren’t big breakfast eaters before school. Gasp! I know, I know…it is the most important meal of the day, blah blah blah. I try, I really do. I consider it a success if I can at least get a waffle or toast in them. 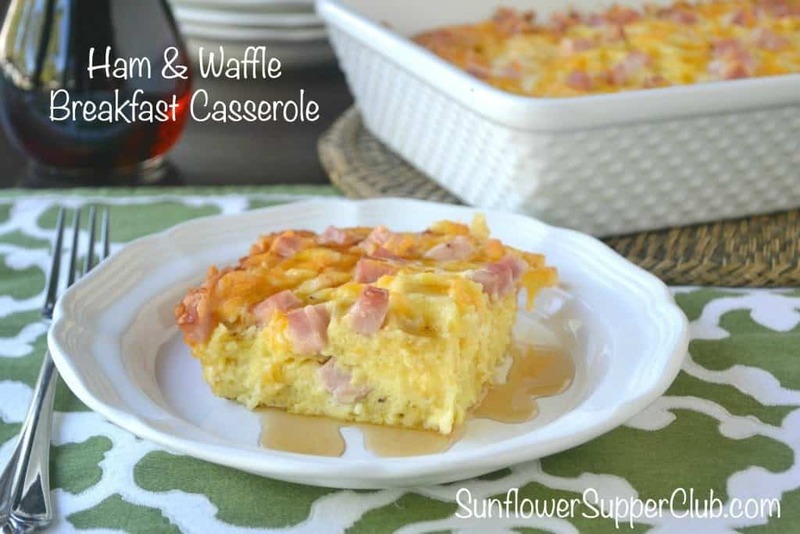 This casserole uses those frozen waffles, and it comes together quick. That makes it perfect on a school morning or for a lazy day brunch. The bake is best assembled the night before, which will literally take you about 10 minutes. You want the eggs to soak into the waffles. You’ll see in my recipe that I call for 6-8 waffles. I generally use 7 in mine. I like the entire surface of each layer to be covered. I think that is the OCD in me. Here is how my waffle layers look. I’ve often served this for dinner. We like to eat breakfast foods for dinner a lot in the winter. Do you ever do breakfast for dinner? It is one of our favorites. When my kids were younger they thought it was so fun to eat breakfast at night. I love that it is easy. Just assemble this in the morning and throw it in the fridge. Dinner will be ready to throw in the oven that evening when you are. This casserole is savory and delicious as it is. If you want to sweeten it up a bit, just drizzle with syrup or top with fruit. Spray a rectangular 2 quart baking dish with cooking spray. Place 3 of the waffles in the bottom of the prepared dish, cutting into pieces to fit. I use another ½ of a waffle to fill in all the spaces. 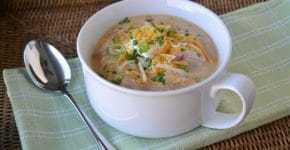 Evenly sprinkle with ½ of the diced ham and ½ of the shredded cheese. Repeat with the other waffles, then top with remaining ham and cheese. In a medium bowl, whisk together the eggs, milk, dry mustard, hot sauce, kosher salt and black pepper. Gently pour the eggs evenly over the casserole. Refrigerate overnight, or at least for 4 hours. Bake in a 350 degree oven for 45-50 minutes or until set. Watch after about 35-40 minutes and tent with foil if it is getting too brown. Let sit about 5 minutes before cutting. Drizzle with syrup if desired. Cooks note: I use 7 waffles in mine. I like the entire surface to be covered. I put 2 whole waffles in the bottom of my dish and then cut 1 in half. 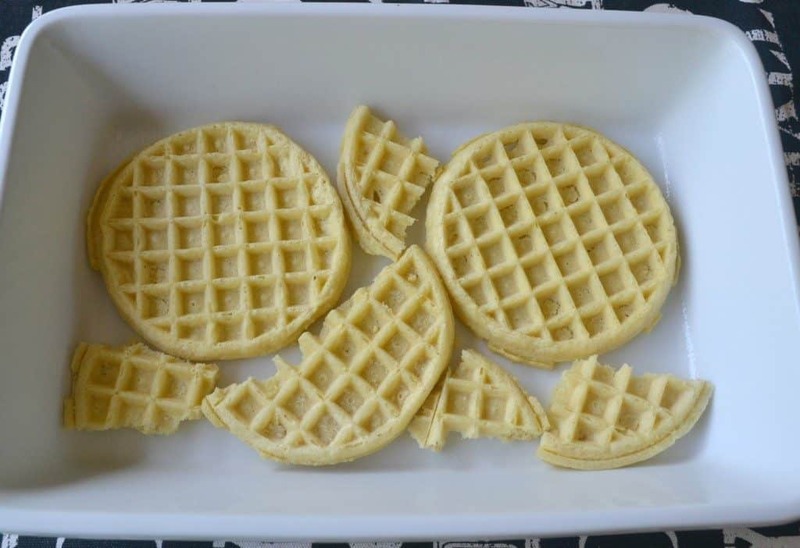 I then use ½ of another waffle to fill in the gaps.I do this on each layer of waffles. 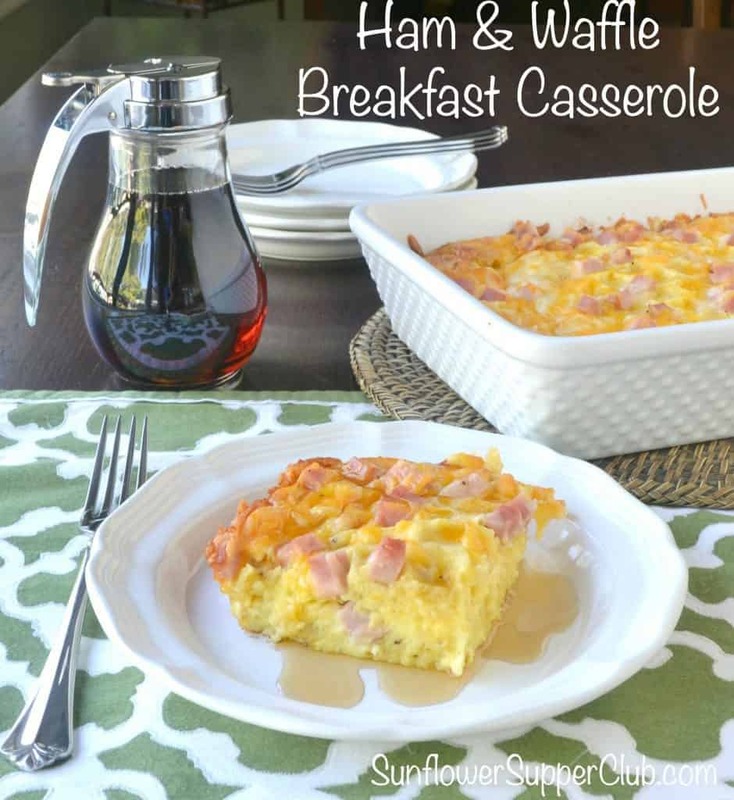 This breakfast casserole was inspired by this one from Rachael Ray.